The fire in Christchurch’s prestigious department store was one of the worst in New Zealand’s history. 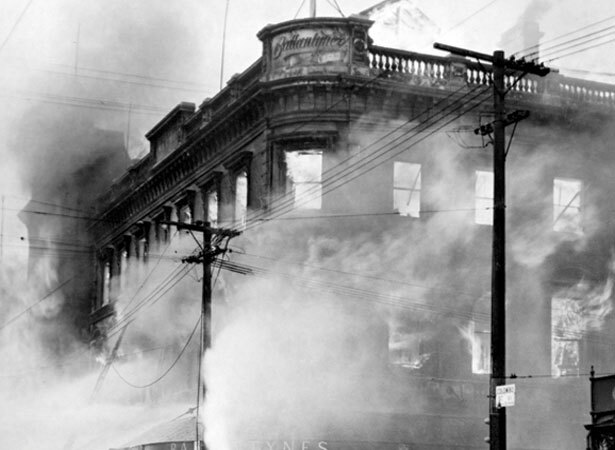 When the fire began in a basement about 3.30 p.m., 250–300 people were shopping at Ballantyne’s, which had a staff of 458. The staff member who saw smoke coming from a stairwell asked a colleague to call the fire brigade. Tragically, the brigade did not log this call. By the time firefighters arrived at 3.48 – ill-equipped to tackle anything more than a fire in a cellar – the blaze was out of control. However, staff on the ground floor assumed the fire could be contained and no general evacuation was ordered. Staff returning from a tea break were told to go back to work, and customers entered the store as late at 3.56. As the smoke increased, individual staff members cleared their areas, and all customers and most staff escaped. But the ‘millinery girls’ and those working in credit and accounts were trapped. Thirty-eight staff and two auditors perished in the fire, and a pregnant staff member jumped to her death. We have 2 biographies, 8 articles, related to 41 die in Ballantyne's fire.